I recently attended a seminar on bariatric surgery with a friend. During this time I learned that after the surgery you are strictly forbidden from eating any form of cooked dough including most bread, pizza crust etc. I have been told by those that have had the surgery and forgot the rule that you immediately regurgitate the dough. At this point I began thinking about how this might apply to starch bound fish food. Most of the starch in our foods is from whole ground green pea flour. Dried egg whites are also used to bind our food. 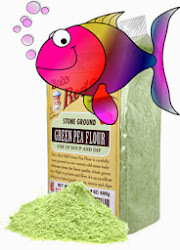 Green pea flour contains roughly 21% starch. The use of green pea flour allows us to cut protein and fat without adding excessive starch energy. Our Herbivore food contains roughly 11% starch which is the highest amount of starch found in our line of foods. Green pea flour contains roughly 34% fiber which aids in digestion. This is very important for herbivores that have a very long digestive tract. After mixing Herbivore is a very thin paste that can literally be poured onto the trays to be dehydrated. The other foods have more body but can easily be spread over the trays to be dehydrated. 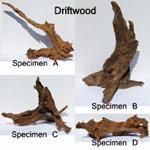 Once dehydrated the food can be broken into pieces and with a little practice crumbled into smaller pieces for feeding. I can't prove it but it stands to reason that once fed the reverts back to the form it took before dehydration. This is a light paste that can easily be digested. Fish Foods bound entirely with starch need a minimum of 15% starch to hold the food together but most contain much more. See How to Read a Fish Food Label for more information. Increased starch use produces a very thick paste or more than likely a dough. The dough is then extruded at 350 degrees F. to produce a pellet type feed. It stands to reason that once these pellets are fed that they revert back to dough. I have read many comments about filler (excessive use of starch) causing digestion problems in fish. To make this problem worse is the fact that these foods contain very little fiber to aid in passing the doughy mess. Its no wonder fish often suffer from intestinal blockages which causes stress which manifests itself in any number of other different problems. To answer my question, No there there is nothing wrong with making a little dough. Just don't feed it to your fish!